Pick up your standards and fall back to the Command Tower - this is the Commander Game! This is a weekly game. Each week, a challenge will be set and you'll be tasked with designing a Commander-oriented legendary creature that fits the challenge. The challenge setter judges after about a week and chooses a winner, and that winner sets and judges the next challenge. If you're unfamiliar with the Commander format, check here. 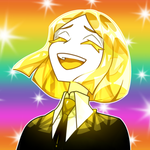 Our first judge of the new thread is amechra! Please kick us off with a new challenge! Alright everyone, I'd like to start us off with a nice, calm challenge as everyone gets used to the new boards. Make me a commander that cares about names - anything from Nazahn, Revered Bladesmith to a legendary Meddling Mage to something even crazier. I'm a Johnny/Timmy hybrid, so I'm looking for creativity, elegance, and interactivity; I'll be judging on April 14th. Whenever a nonland nonlegendary permanent enters the battlefield under your control, gain control of all permanents with the same name as that permanent. The Inexorable Blob gets +2/+2 for each creature named Blob onto the battlefield. Whenever The Inexorable Blob deals damage to a creature that creature loses all abilities and becomes a 1/1 green Ooze creature named Blob with indestructible. 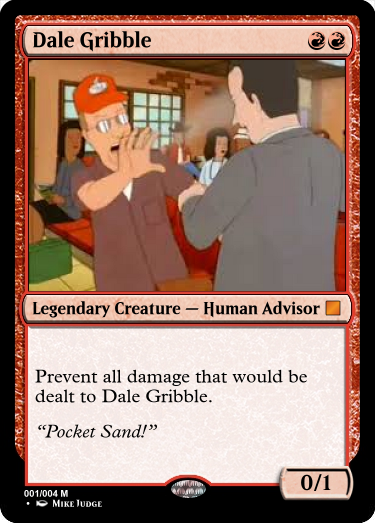 When I first made this card I had to spend about five minutes trying to figure out how it'd be used. , Sacrifice another creature: Creature spells you control and creature cards you own that aren’t on the battlefield become a copy of Lazav, Lethal Silhouette until end of turn. Grandeur — Discard another card named Lazav, Lethal Silhouette: Lazav becomes a copy of another target creature until end of turn. ~ is every creature type (even if this card isn’t on the battlefield). ~ has all names of nonlegendary creature cards in addition to its name (even if this card isn’t on the battlefield). 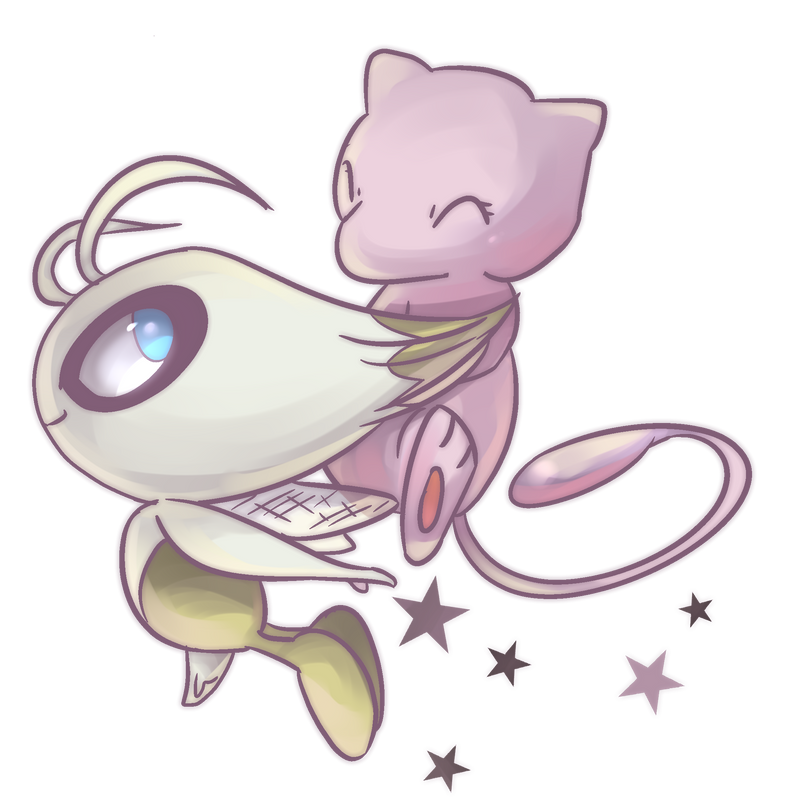 celebi: The problem is, when The Inexorable Blob deals damage to something and then turns it into a 1/1, it will immediately die due to having the damage marked on it. Flo00: They turn into 1/1,s with indestructible, actually. As ~ enters the battlefield, choose a nonland card name. Pay 1 life, : Choose a nonland card name. Permanents and permanent spells with the chosen names have no abilities and no card types, and nonpermanent spells with the chosen names can't be cast. Haunted creatures are named "Rail, the Reincarnater" and has "When this creature dies, put all cards haunted or cyphered into it into their owner's hands." , pay 4 life: The next instant or sorcery you cast this turn gains cypher. Whenever you would name a card or choose the name of a card, you may name two cards or choose two names instead (The effect that caused you to name a card or choose a name applies to both names). At the beginning of your upkeep, look at the top card of your library. If it’s a card with a name that contains ‘Blast,’ ‘Dragon,’ ‘Fire,’ ‘Flame,’ ‘Lightning’ and/or ‘Ruin,’ you may play that card without paying its mana cost. 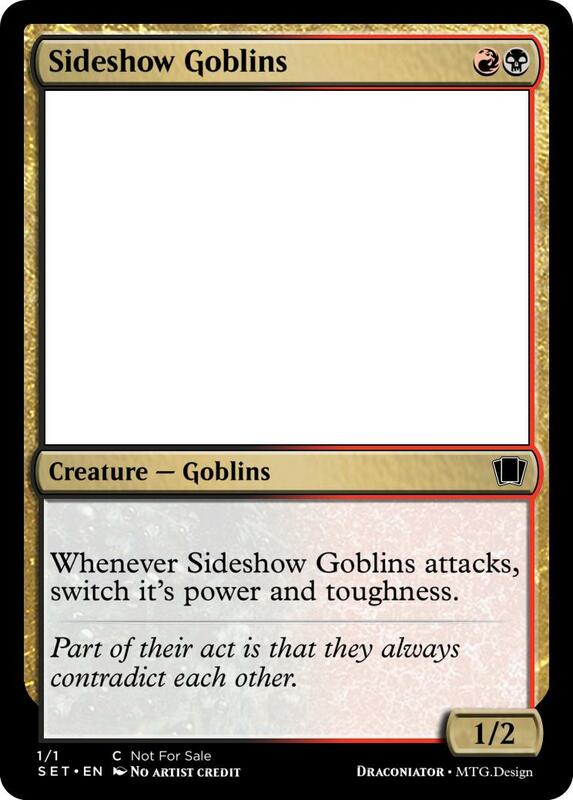 Note: This is an Un-card. As an additional casting cost, sacrifice 1 legendary creature you control, and count the number of vowels in its name. Destroy target non-land permanent with converted mana cost equal to the number of vowels in the name of chosen card and do that much damage to all players. "Sometimes you just have to appreciate a good bonfire"
When ~ enters play, target creature loses all attributes and abilities and becomes a 1/1 red legendary creature with plot armor named "Tim the Enchanter" with " : target creature must clash with target rabbit." "Follow only if ye be men of valour, for the entrance to this cave is guarded by a creature so foul, so cruel that no man yet has fought with it and lived! Bones of full fifty men lie strewn about its lair. So, brave knights, if you do doubt your courage or your strength, come no further, for death awaits you all with nasty, big, pointy teeth"
Fun: This category is for two things - how much would I look forward to building a deck around your card... and how much would I groan if I saw someone else using it as their commander. Accuracy: How much does your card stick to my prompt? Does it feel like you taped "cares about names" onto your card? Creativity: How out there is your card? This primarilly exists to reward people who went for crazier card ideas. Elegance: How clunky is your card? Does it have any extraneous mechanics or other oddness? Fun (B) :- Like you said, this guy would be fun to play clones with. I could also see some janky token strategies. My one concern is that you'll end up stealing stuff like Sol Rings and other staples, but my stance is that that's a good thing - it pushes your group's deck-building. Accuracy (A) :- This takes my prompt and executes it pretty well. I'm hard-pressed to think of a way of pulling off this effect without checking names. Creativity (B) :- Lobo's effect on deck-building is pretty interesting - both in terms of how you build your decks and how your opponents will end up building around him. Fun (C) :- This guy doesn't pull in very many directions - it screams voltron, but other than that it's pretty open. I wouldn't mind playing against this guy too much - a blocker with First Strike ruins its day, among other things. Accuracy (B) :- You could have designed this guy to just care about Oozes, but caring about Blobs is much more flavorful, and doesn't stand out as too weird. Creativity (A) :- Permeating Mass is a card I love quite a lot - combining it with a Relentless Rats effect just feels so right that I'm kinda embarrassed that I didn't think of it first. Elegance (D) :- Unfortunately, you're going to suffer on this one. I'm not seeing where Red or Black factor into this card at all - heck, you could have all of those abilities in mono-Green. I'm also questioning the choice of Hexproof over Indestructible - your "unstoppable" ooze dies to a single blocker with deathtouch. But that's less of an issue than the colors. Fun (C) :- Huh. A UB commander that encourages you to run a ton of creatures. That's pretty distinctive. On the other hand, it doesn't really care about what those creatures are, so that's less interesting. Accuracy (A) :- Grandeur is pretty much the kind of thing I asked for. So good on you. Creativity (A) :- You made a Grandeur effect usable in Commander. My hat is off to you. Elegance (C) :- That first ability is, unfortunately, janky as hell. Additionally, the "creature spells you control" clause is weird - I'm not actually entirely sure what happens when that spell resolves. 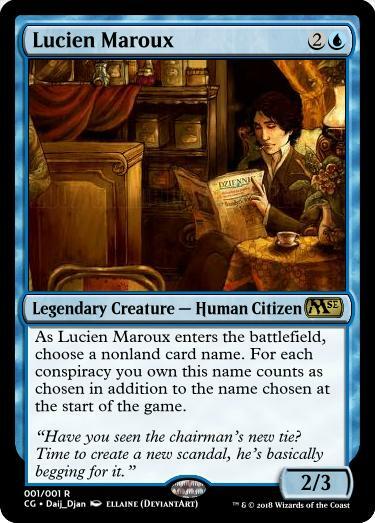 As Lucien Maroux enters the battlefield, choose a nonland card name. For each conspiracy you own this name counts as chosen in addition to the name chosen at the start of the game. "Have you seen the chairman's new tie? Time to create a new scandal, he's basically begging for it." Fun (A) :- This guy can work magic with some of the Hidden Agenda cards. Unfortunately, those are reasonably niche... but if your group allows them, they still add another level of strategy to the whole game. If your group doesn't, you aren't playing with this guy. Accuracy (A) :- Pretty good here - naming fits in here neatly and logically. Creativity (B) :- This was going to be lower (due to just being a "twice the number of things" effect), but then I realized that it's much more dynamic than that - flicker Lucien and pick a new set of names. Plus, it frees you up to name Lucien for ALL of your Conspiracies, secure in the knowledge that you can adjust your choices later. Elegance (A) :- Pretty neat and tidy. Good job. Fun (C) :- Hmm... This is just like Mistform Ultimus in terms of deck building, except you can mix in some "care about other creatures with the same name" cards. Unfortunately, most of those aren't in Blue. Accuracy (A) :- When the only reason your card isn't a slightly-harder-to-cast version of another legendary is that it has all the names, that certainly qualifies. Creativity (D) :- Like you said - this is literally just blending two creatures together. It's just kinda... there. Elegance (A) :- There is, however, a certain elegance to "it has all the names, and all the types". As Vanisher of Names enters the battlefield, choose a nonland card name. Accuracy (A) :- I did suggest Meddling Mage, didn't I? And Vanisher is that card on crack. Creativity (C) :- It's a pretty logical extension of Meddling Mage et al. Elegance (B) :- The one bit that I'd question is how cheap picking additional names is. But otherwise, I'm not seeing too many other problems. Fun (B) :- Cypher and Haunt make a cute couple - it gives you a nice "cards in exile" theme that you can build around. Plus, you've got a nice engine for returning cyphered cards to your hand. Accuracy (D) :- Unfortunately, it looks like you just glued on the name change to satisfy the requirements. So you aren't going to be getting an amazing score here, I'm afraid. Creativity (B) :- Like I said, it's a cute couple of mechanics, and it's nice to see an Esper commander that isn't "I love artifacts". The way things bounce back is also nice - it gets across your theme of reincarnation quite well. Elegance (C) :- Barring your templating issues, you're mostly fine. However, I'm a not entirely sure that activated ability needs to cost that much - you could get away with dropping that life cost, I think. 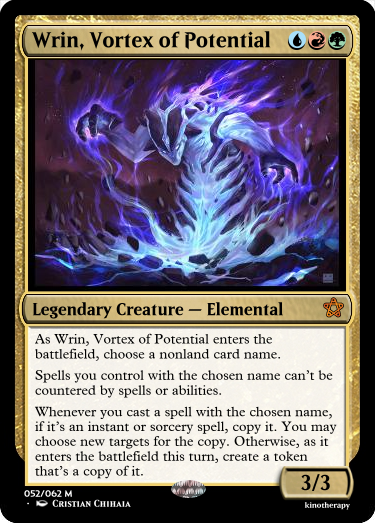 As Wrin, Vortex of Potential enters the battlefield, choose a nonland card name. Spells you control with the chosen name can't be countered by spells or abilities. Whenever you cast a spell with the chosen name, if it's an instant or sorcery spell, copy it. Otherwise, as it enters the battlefield this turn, create a token that's a copy of it. Accuracy (A) :- This definitely did what I was asking for, yep. Creativity (B) :- I mentioned before that Wrin is essentially an alt-version of Riku... but there's enough of a difference that it's obvious that you didn't just tweak some numbers. Restricting the copy effect to a specific name is actually quite clever, since it forces you to work out your own workarounds. Elegance (C) :- Unfortunately, I'm going to have to mark you down here. Your rules text is pretty damn long - it's hard for the rest of the table to see what Wrin does at a glance. Besides, I feel that a 3/3 for 3 with this big of an upside is pushed. Fun (C) :- I'm giving JJJS better marks than I normally would because he makes certain cards actually usable in EDH. Heck, there are a lot of really interesting combos with him (Assembly Hall, Spellweaver Helix, Twinning Glass). The only issue I have is that he probably should have a non-land clause, and that there are a few REALLY abusive combos with him (Echoing Truth is a boardwipe for 2, Bazaar of Wonders auto-counters everything...). Accuracy (A) :- Can't fault you here. Creativity (A) :- We've seen "~ has the name of all creatures" before, but not "~ has the name of all cards". As I mentioned earlier, this opens up a ton of possible combos. Elegance (A) :- No problems here. Fun (C) :- There's pretty much one deck you can build with this guy - and it has a lot of targeted discard, counters, and Surgical Extraction effects. 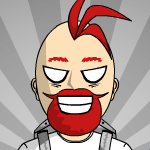 And that's decent enough, I'd say. 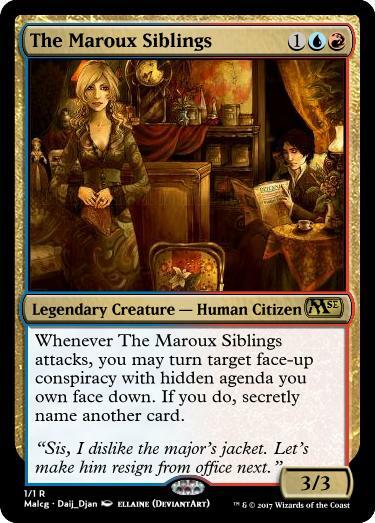 There's also some lost potential due to a lack of interaction with the "cares about names" cards from the Conspiracy sets. Which is a shame, because he seems like the kind of legend you'd see in one of those sets. Accuracy (A) :- It's a Doubling Season for names - it'd be hard to be more name-related than that. Creativity (C) :- Unfortunately, it's a Doubling Season for names. On the list of "things to do to boost a mechanic", that's right up there with "make it cheaper". Elegance (A) :- Fortunately, you can't get much more elegant than a doubling effect. Rolling Sap counts as a token creature. 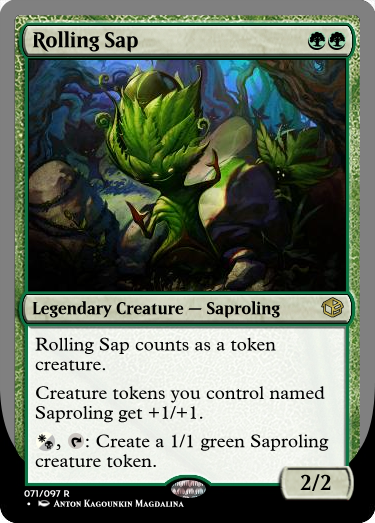 Creature tokens you control named Saproling get +1/+1. 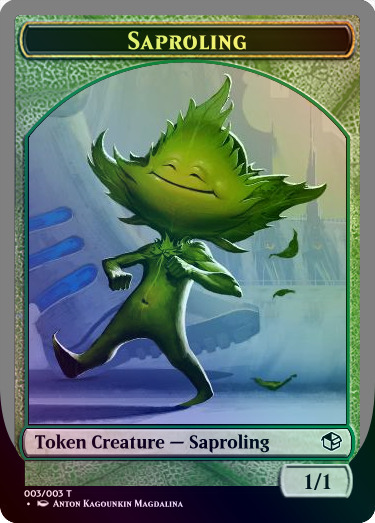 , : Creature a 1/1 green Saproling creature token. Fun (B) :- It's a Saproling commander that you can drop turn two. I approve. He does seem more like a member of Ghave's 99, though. Accuracy (D) :- There's absolutely no reason for this card to care about names other than "that's the prompt". Replacing the middle ability with "Other Saproling creatures you control get +1/+1" wouldn't change how this guy plays at all. Creativity (C) :- This guy's just a lord and a token maker - I'm not getting a sense of why they're Legendary. Elegance (D) :- You're losing quite a few points here. Both for the whole "this is a token creature" thing, which is really odd - unless you're abusing stuff like Mirror Gallery + Populate, there's absolutely no reason for that to be there. Also, I'm docking you for the janky anthem again. Fun (A) :- The irony here is that there aren't that many good mono-red commanders for burn. So this guy already opens up some build choices. Besides, you have your pick from 300+ red cards, so there's no shortage of versatility here. The one issue is that you're going to be a removal magnet, which is fine. Accuracy (A) :- This definitely is an excellent rendition of "cares about names". Good work. Creativity (B) :- I'm going to go out on a limb and say that this world is poorer because Uryt wasn't in the last un-set. Good stuff. Elegance (A) :- Uryt is a devastatingly simple card with a lot of power. As Korla, Doom Speaker enters the battlefield, choose five card names. At the beginning of your upkeep, search your library for a card with a name chosen with Korla, reveal it, put it into your hand, then shuffle your library. You lose life equal to a fifth of your starting life total, rounded up. Fun (B) :- Holy. Crap. My brain is warring over whether or not I love this card (due to the pure combo fuel) or hate this card (because it's going to lead to really same-y games). It's also the epitome of suicide black - you have five turns to win from when you drop Korla. Accuracy (A) :- You don't just use one name, you use five! That's just plain lovely. Creativity (C) :- This is a pretty standard black effect - it's basically just Dark Confidant on steroids. I knocked you down a notch for not making it six and one-sixth, because that was just a missed opportunity. Elegance (B) :- You're asking people to do division in their happy-fun-game time. Plus... memory problems, your name is Korla. I hope you wrote those names down. norench - Irritable Vowel Syndrome/There are some who might call me Tim. Both of these are invalid entries - this is a game for creating Commanders, so you should have entered a legendary creature. Better luck next time. Besides, the quote is "There are some who call me... Tim? ", so no points for that reference. In summary, we have a tie for first place between Daij_Djan and BurningCreator . However, I'm going to be giving the win to miku - Daij, you'll just have to console yourself with your literal mountain of trophies. Also in summary - I hate all of the people who only posted a render. Thanks for the carpal tunnel pains, folks. 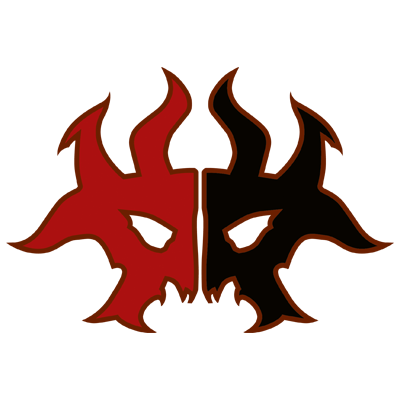 I chose the 5 motif as an homage to Doomsday (also referenced in the name). Fair points on the rest, though. Even if I hadn't shown blatant disregard for the history of Magic, you would be looking at a B+ at best. I misread the criteria as card that cared about names. My bad. Yeah, looking back, I probably should have made it non-land. Still, not bad for an uncard I made as a joke like 4 years ago that I remembered because it fit this contest. Still, taking (a shared) third isn't too shabby. Daij, you'll just have to console yourself with your literal mountain of trophies. Congrats to the winner. And I am stealing the way you judge from now on amechra. It looks like a week has passed and no new challenge? Do we wait, or does it go to runner up and Dajidjan gets more rewards? EDIT: Ok then, here we go! Dominaria brings us Blackblade Reforged, the sinister blade of Dakkon Blackblade and Korlash, Heir to Blackblade now carried by Gideon himself. For this challenge however, how about we reverse this process? Choose any existing Equipment card (doesn't have to be legendary - please let me know your choice ) and design a Commander that would wield it. Have fun! LifelinkAs long as Adha of Flight Nightingale is an Angel, she has +2/+2 and first strike. 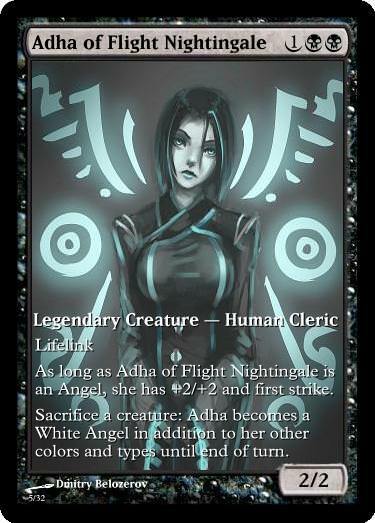 Sacrifice a creature: Adha becomes a White Angel in addition to her other colors and types until end of turn. I just asked for a random equipment and got Piston Sledge. Whenever an atrifact card is put into your graveyard from the battlefield, untap Eugene, Enraged Pachyderm and it gains haste and first strike until end of turn. Whenever Eugene deals combat damage to an opponent, you may return target artifact card from your graveyard to your hand. For this challenge, I chose to design a Legendary Creature around the equipment Blinding Powder. I'll choose Sword of the Meek. 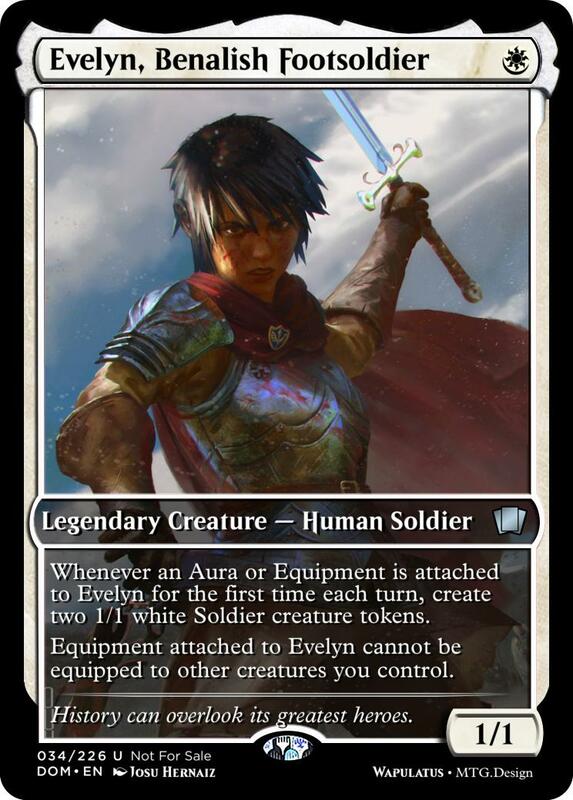 Whenever an Aura or Equipment is attached to Evelyn for the first time each turn, create two 1/1 white Soldier creature tokens. Equipment attached to Evelyn cannot be equipped to other creatures you control. History can overlook its greatest heroes.